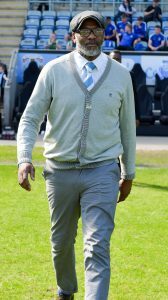 Sky Blues fans will get the chance to bump into ‘The Flying Postman’, John Williams at the Ricoh next Saturday when the Sky Blues take on Wycombe Wanderers in a League One fixture. TFP is the Coventry City's Former Players Association’s ‘special guest’ at the game (as he has been in past seasons). For this one he will be watching two of his former clubs! Our popular former forward, perhaps CCFC’s fastest ever player, will be looking to Mark Robins’ men to continue where they left off with that stirring last gasp win at Charlton Athletic last weekend. The speedy forward scored 11 goals in 86 Sky Blue appearances between 1992 and 1995 before leaving for Wycombe Wanderers. John finally hung up his boots in 2009 aged 40 becoming (amongst other things) a football agent, a youth and community worker in his home city of Birmingham and running his own promotions company, ‘Flying Postman Productions‘. John is a regular at our annual Legends Day and, when he can, plays a part in the Former Players’ Legends XI Charity games. You can be sure John will be visiting the club’s youngest generation of supporters before the match in the Club’s Family Zone session. The Zone is run by CCFPA Associate member Pat Raybould and her hard working team of volunteers (including CCFPA members). You can also meet John around the Ricoh’s corporate areas before the game where, likely, club host (and CCFPA member) Brian ‘Harry’ Roberts will tease some interesting memories from the jovial Brummy. After the game fans can go down to the G-Casino at the Arena and watch John on the stage at Lady G’s in the Casino with our very own Billy Bell in what we are sure will be an informative and entertaining double act. If you can’t make the game you can still listen to John ‘riding the airways’ with the BBC CWR live matchday commentary team. His views on the Sky Blues initial part of the season are bound to be both pertinent and interesting!